Hello! 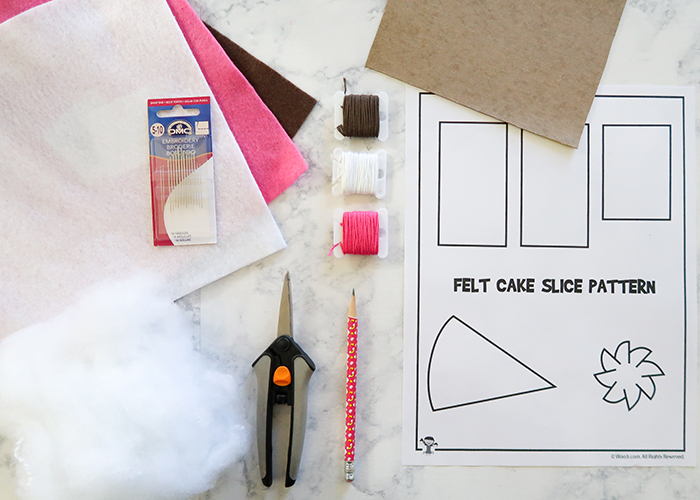 Today we’re diving into a slightly more complicated felt food project, this cake slice felt food tutorial. This is super cute and you can make any flavor of cake you’d like. Don’t worry though, there are plenty of detailed photos to help guide you through. 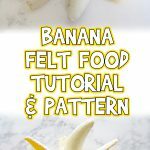 Also, like with all of my felt food tutorials, there’s a very helpful printable pattern for you at the bottom of the post. Here’s what you’ll need. 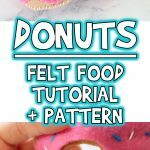 Check out our other felt food sewing patterns here! 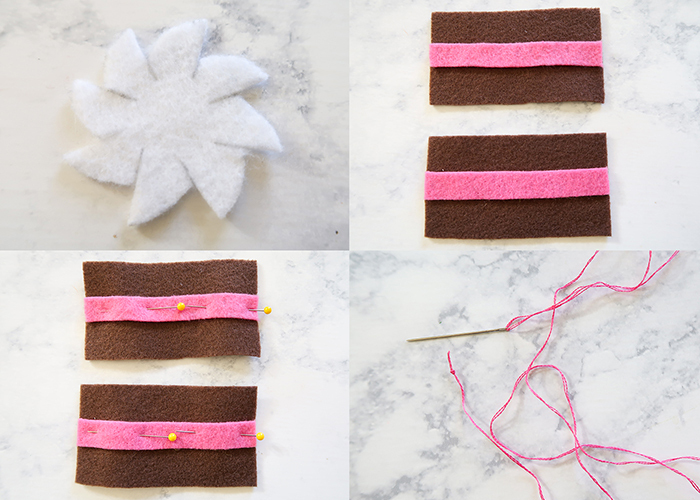 Brown, pink, and white felt. Brown, pink, and white embroidery thread. Lightweight cardboard. The side of a cereal or cracker box works perfect. 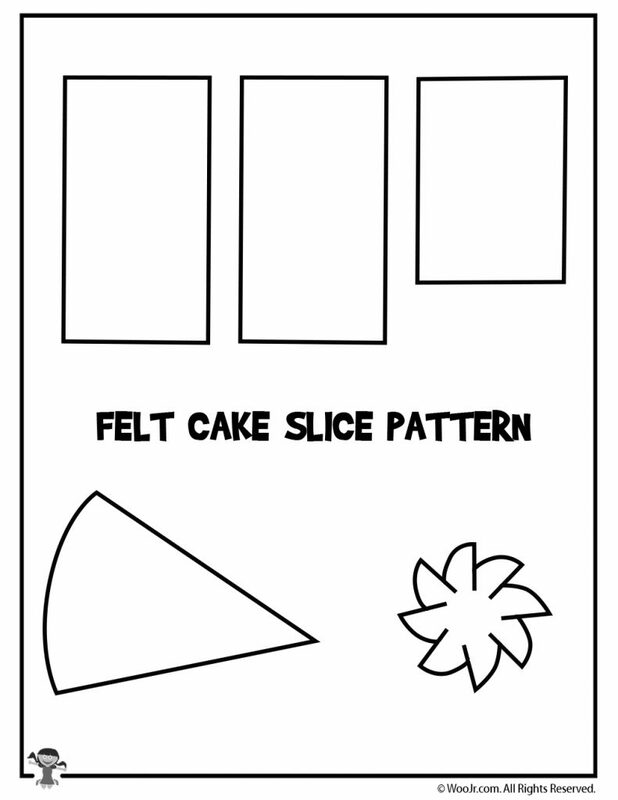 Printed Felt Cake Slice Pattern. See the bottom of this post. 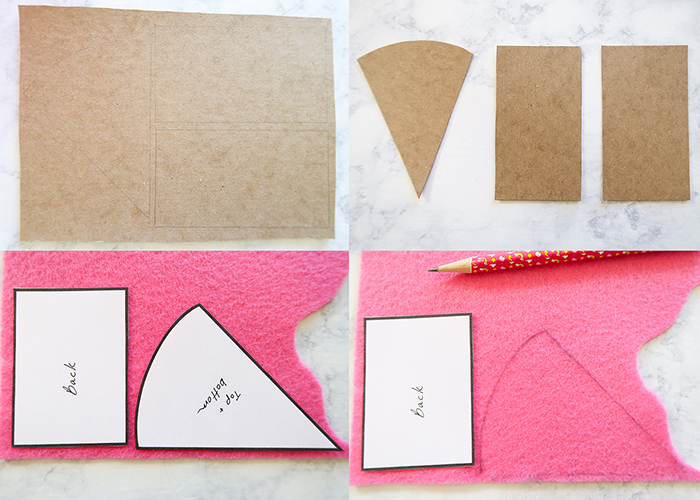 Start by carefully cutting out all of the pattern pieces. Make sure to trim along the black lines going into the whipped cream piece as well. 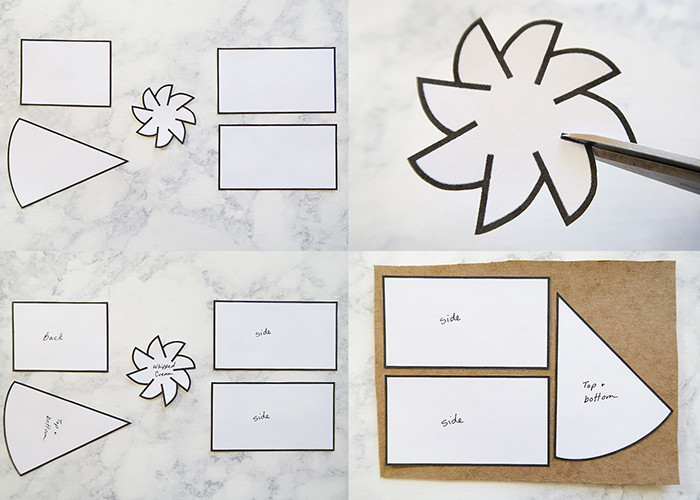 If you’d like, you can take a moment to label your pattern pieces as shown above. Now take the thin cardboard and put your two side pieces and the top/bottom piece on it. Trace around them with a pencil, and cut them out. Set the cardboard pieces aside for now, we’ll use them later when we start assembling the cake slice. They’ll help the cake keep it’s shape so it doesn’t turn into a triangular blob. 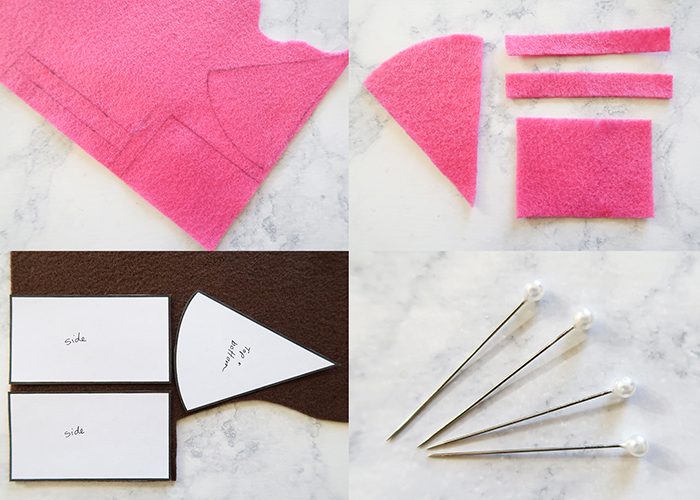 Next take the back piece and the top/bottom piece again and trace them onto your pink felt. For this next part, we’re going to make the side frosting. 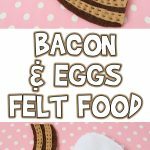 This part is optional because it isn’t included in the pattern, but it’s super easy to draft. 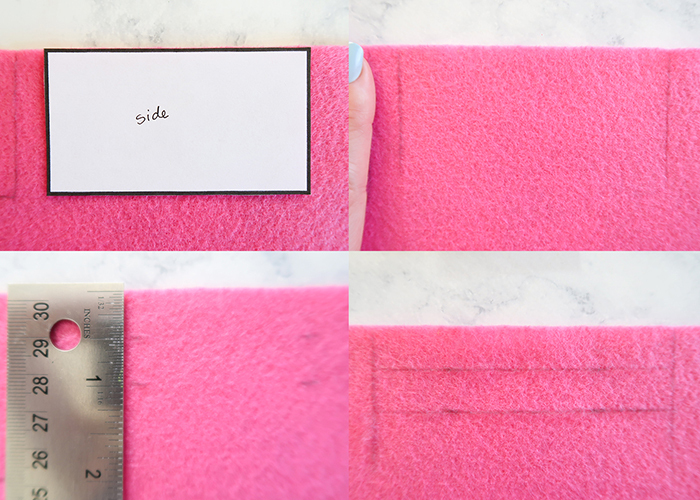 Just take one of your side piece patterns and lay it down on your pink felt. Trace just the short sides of the pattern piece. Then measure and mark out two sections that are 1/2 inch wide. Ta da! 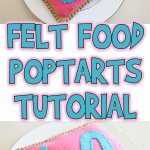 Super easy and you have frosting pieces to cut out. 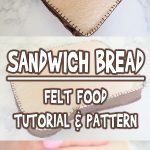 I wanted to show you how easy it is to customize your cake or other felt creations by using the patterns I provide and modifying the technique. Don’t feel limited by patterns, use them to your advantage! Now go ahead and cut out all your pink pattern pieces. 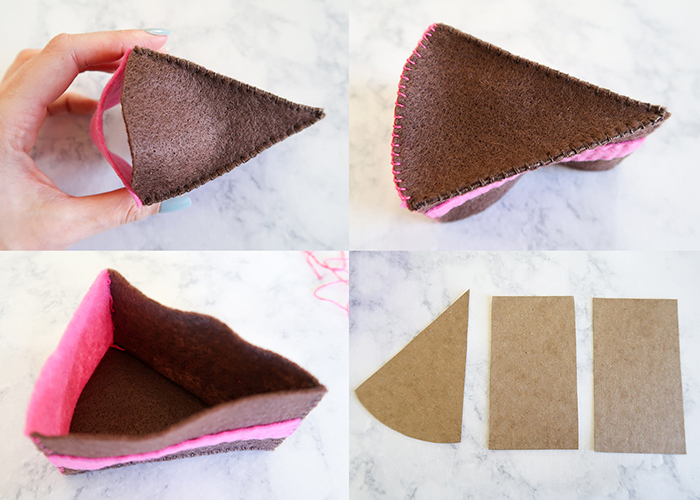 Next you’re going to lay your two side pieces and the top/bottom piece down on your brown felt. Here’s where we need those sewing pins. 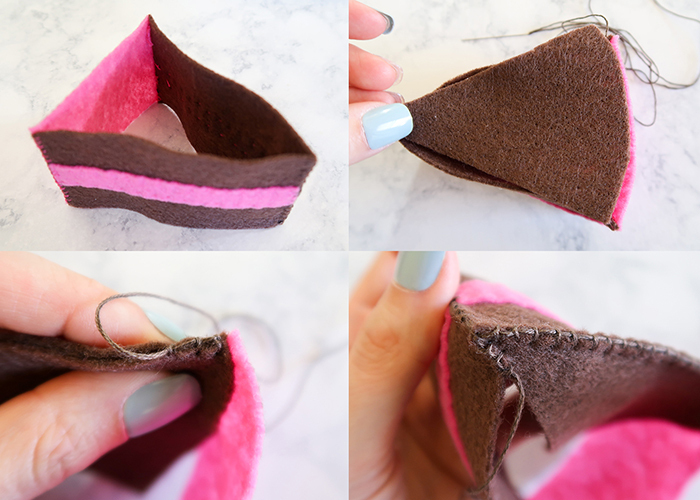 It’s difficult to trace on darker felt, so for this part I recommend using pins to hold the pattern in place while you cut it out with your scissors. 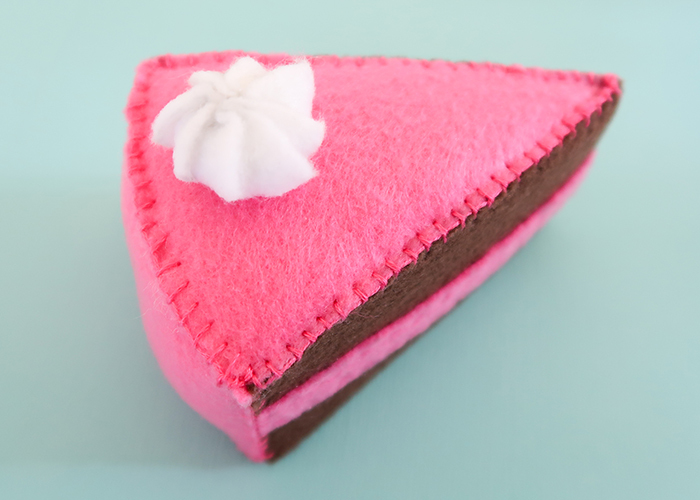 Next just place your whipped cream piece on your white felt and trace around it. Then cut it out, making sure to cut into the cream where the lines are again. This is important for later. Now we can get to the fun part and start building our cake! Grab your two pink frosting pieces and lay them on top of your brown side pieces. Make sure they’re centered, and pin them in place. Then thread an embroidery needle with three strands of pink embroidery thread, and knot the end. 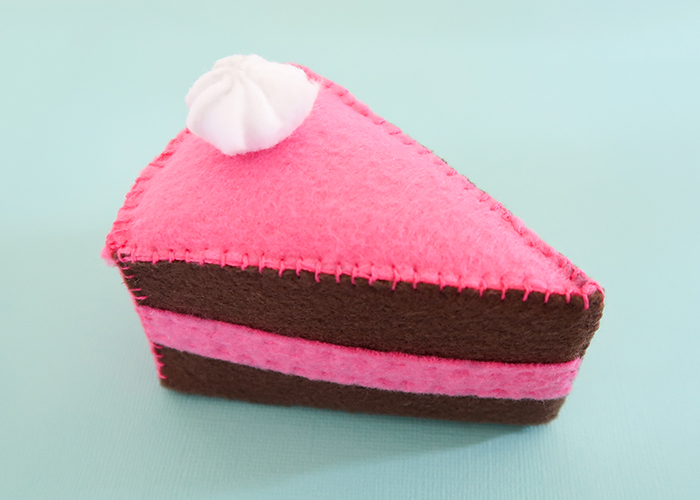 Sew the pink frosting into place using a simple running stitch on both sides of the frosting. Do this for both side pieces. 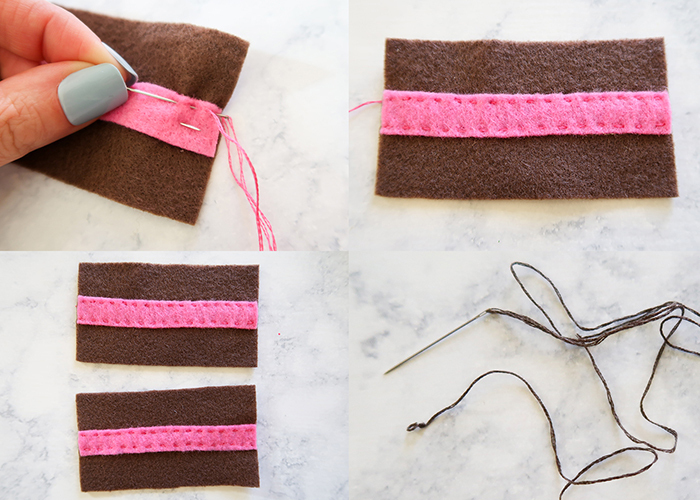 Next you’re going to prepare some brown embroidery thread the same way we did for the pink. Place your two side pieces together with the frosting facing outwards. 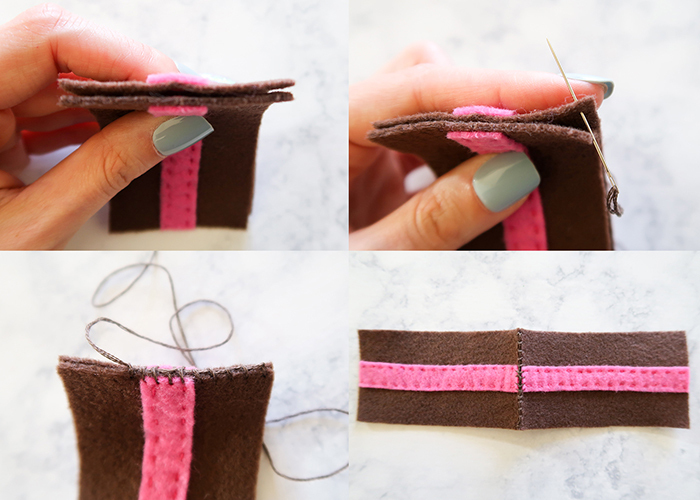 Starting the needle between the layers so the knot is hidden, sew the two pieces together using a blanket stitch. 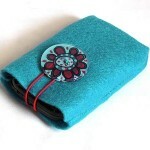 You can also use a whip stitch, but a blanket stitch is slightly more decorative. It should look like this when you’re all done. Next we’re going to take the pink back piece and sew it to one of the two side pieces exactly the same way. 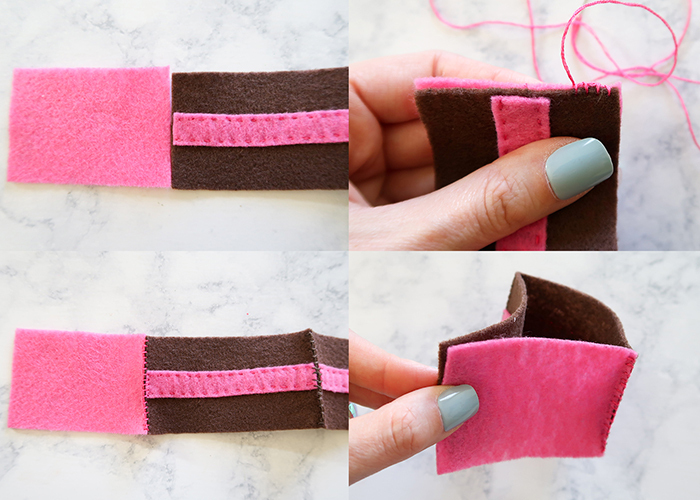 You should have a long strip of felt now that has two side pieces and one back piece. Now you’re going to make the back pice and the other side piece meet up to form a triangle, and stitch that side together as well. I bet you can see the cake finally starting to take shape now. Next you’re going to take the brown bottom piece and set it on top of the triangle, match the sides up. Starting at one of the pink and brown corners, start stitching all the way around the two brown sides, taking care to match up the corners of the triangle. 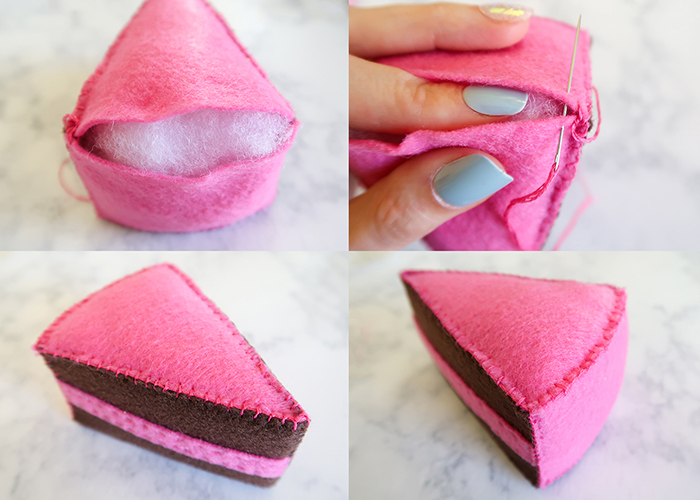 For the pink back side of the cake, switch to pink thread and sew that closed as well. Flip it over, and you have a cake shaped box! Now we need to get those pieces of cardboard we made earlier. Start by trimming them down by about 1/16 of an inch, and setting them into place inside the cake. They should fit snugly, but not super tight. For the sides you’ll need to trim a bit more, just so that when the side pieces are in place you have about 1/8 inch of space where you can see the brown felt above the cardboard. This is so we can sew the top on. 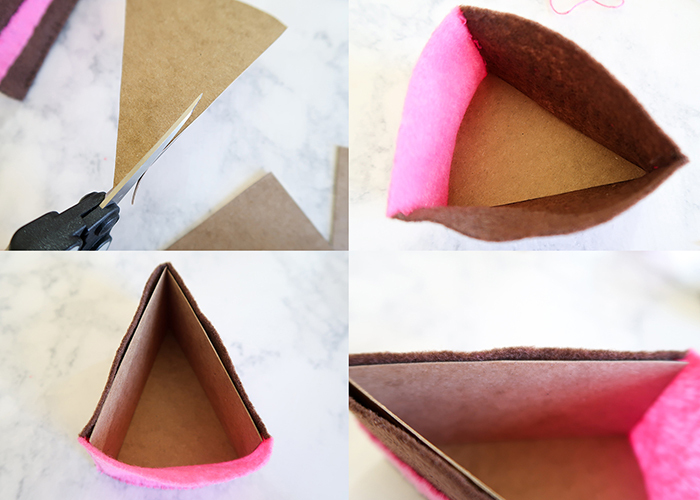 There is no cardboard for the back piece or the top, as we want the back to curve outwards like a real cake and for the top to be fluffy as well like real frosting. Now go ahead and stitch the top triangle on just like we did the bottom, using all pink thread this time. Leave the back curve open, and stuff your cake full of fiber fill. You want it nice and firm. When you’re happy with how it looks, stitch the back closed as well. And your main cake piece is done! Let’s make the whipped cream now. 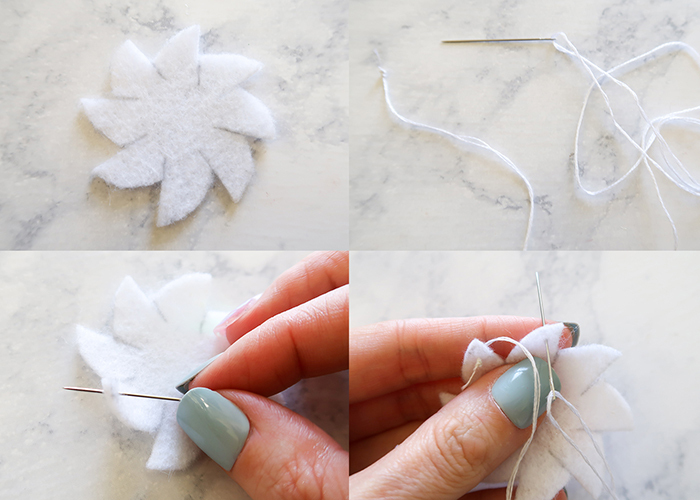 Take your cut out white felt and thread a needle with white embroidery thread. 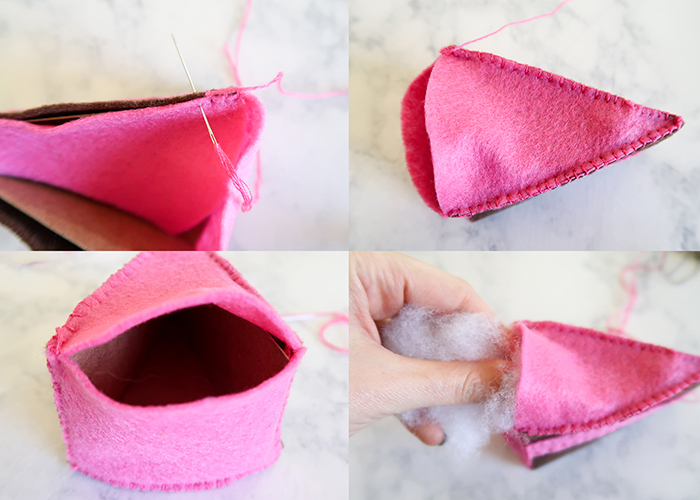 You’re going to stitch through the tips of each little petal, starting at the inside of the felt and ending with the needle pointing outwards like shown. 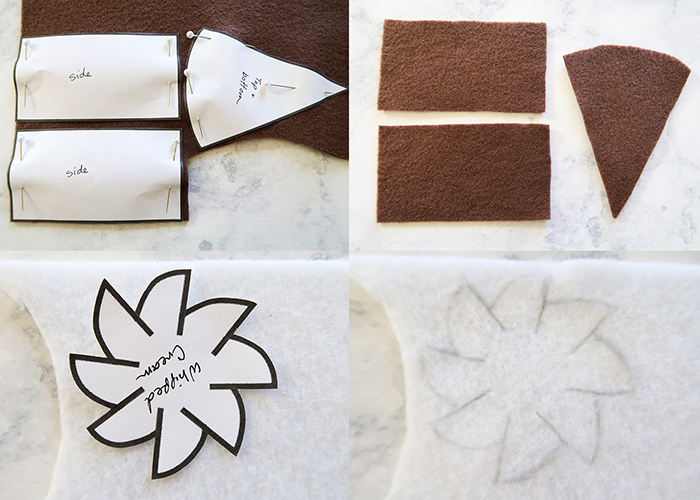 Stitch through each petal this way, pulling the thread gently, and you’ll see the cream shape starting to form. 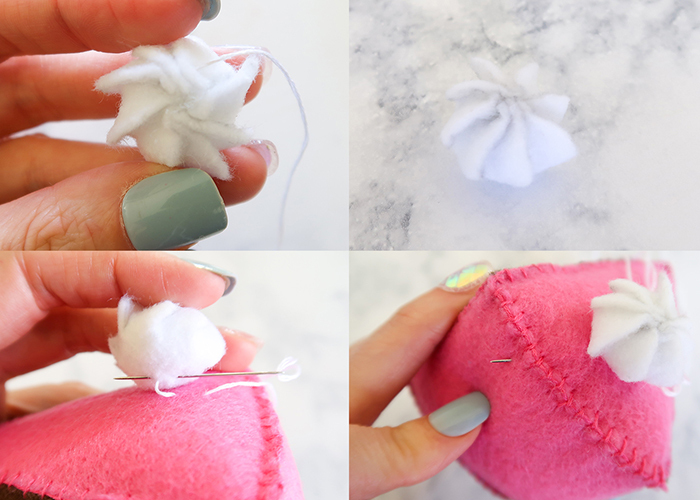 When you have almost all the petals stitched, form a small ball with some fiber fill and stuff it inside the cream. Continue stitching through the petals, taking the needle into already stitched ones to close the loop. 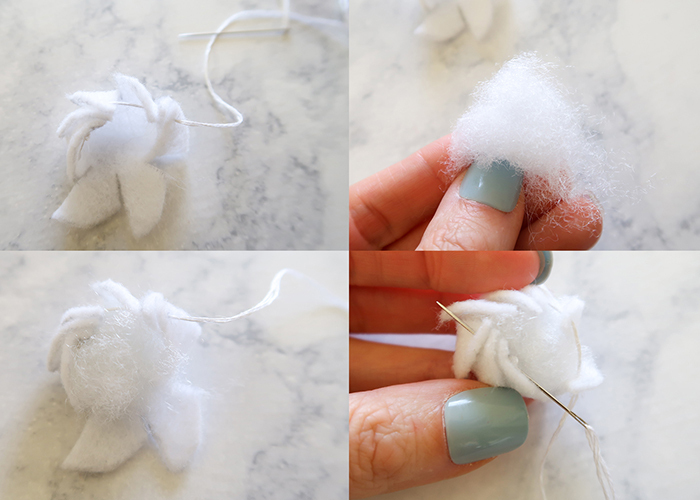 Pull tight and stitch through a few times to secure the whipped cream puff, and then tie and hide the knot. Now just stitch the cream to the top of your cake a couple times. Knot it and hide the thread by pulling your needle through the cake before cutting it off. You can place your cream puff anywhere you’d like, and even use three or four of different colors for a really decadent looking cake. I promise that when you get the hang of it, this cake actually goes super fast. 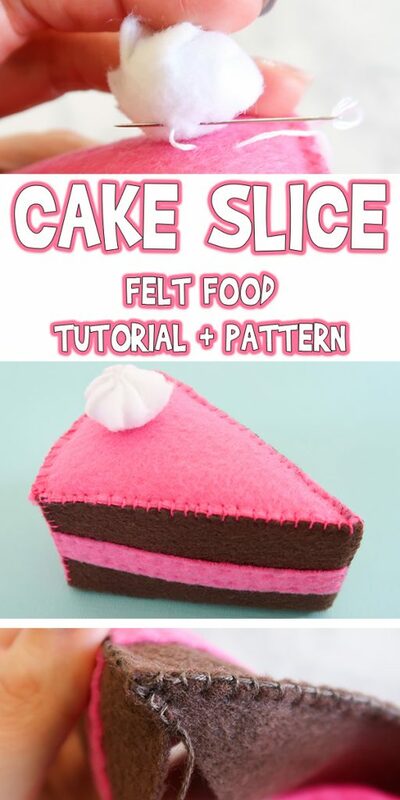 I hope you found this cake slice felt food tutorial helpful, and don’t forget to click on the pattern below to be taken to the page where you can print it out!